Yesterday, I saw yet another post on my social media feeds that was yelling at you. It was a scientist, a trained pharmacologist, reposting a raging rant at how stupid and ignorant and terrible you are for intentionally not vaccinating your children and encouraging others to do the same. I understand his anger, because I know what you are doing is remarkably dangerous. Twenty years ago, the only significant group of people who opposed vaccination were Islamic extremists in a province in northern Nigeria. But that was before the internet, which has made us all a little crazy. Now you don't vaccinate your kids either, because you've heard things on the Web that make you afraid, angry, or some combination of the both. You've gathered friends around you, through the 'net, in your community, and maybe through your church. They all share your fears, and together you've looked for reasons that reinforce what you believe to be true. Some of us, meaning people like me who know that vaccines save the lives of children, are a little freaked out by this. So we do what people do on the internet: we rant at you. You are stupid and evil! And then we throw Science at you, filled with links to authoritative studies that if you weren't an idiot you'd know about, and then we call you an ignorant moron. And then we mix in some swearing, because we're so angry. I don't find this to be a constructive tactic. Oh, maybe it is sometimes for some people. Lord knows every now and again I might get a little yell-y with my kids when they're doing something particularly daft. They're teenage boys, so, um, that happens more than I'd like. But generally speaking, screaming at people and belittling them doesn't work. I don't like it myself. It makes me feel defensive, and makes me feel angry right back. It hardens my heart. And as Jesus teaches me every day, we need to treat others as we want to be treated. Especially if we disagree with them. So I want to speak to you from a different place, and in a different way. Because I know the world now is frightening. Everything has changed, so quickly, and it seems like the most precious things to us are being destroyed. You love your children, and want to protect them, because you know that there are powers out there that threaten the ancient fabric of family. There are huge corporations, great soulless entities that move like empty-eyed angels across our culture, seducing us into a way of life that is tearing us from one another. There is the dark chaos of the web, where truth and falsehood are often indistinguishable, and where unspeakable things are just one or two clicks away. You aren't wrong about that. I feel it myself, because family matters to me. It matters a great deal. One of the most terrible ways our culture is changing us is that it is making us forget about family. We barely know each other, and we've lost sight of the wisdom that can be learned from those who came before. I resist that, as a pastor and as a father. My family, you see, is a family that remembers itself. We have stories and memories from way back, generations and generations. Those people are my blood, just like my children are my blood. I am part of their story, and they are part of mine. So I remember them, and I do what I can honor them. It's one of the Commandments, after all. I've been recently reading the diary of one of my great-great-great-grandfathers, part of a project for my ongoing ministry studies. That's his picture, at the top of the post. 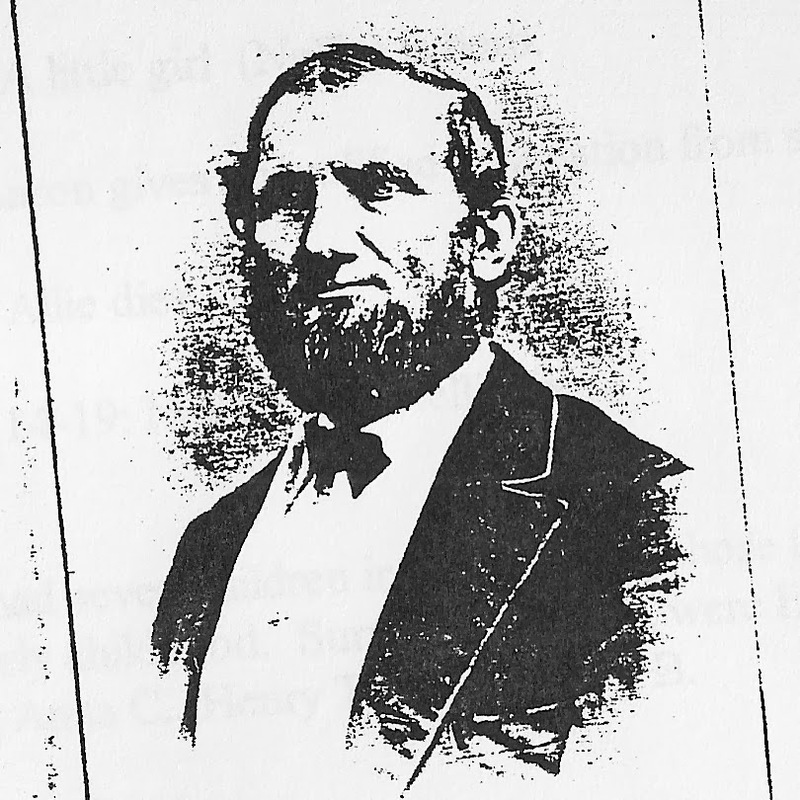 His name was Aaron Baker West, and he was born on March 18, 1825. He was a farmer, and a teacher. He lived off the land, and he was a literate, churchgoing man. He wants to talk with you. I can feel it in my blood, the blood he and I share, and from the faith that we share and I still preach. You need to know what he knew. "The important anniversary of my birthday having again recurred, I have thought proper even at this advanced period of my existence to commence a daily record of the more important events and transactions that may transpire." Yeah, people used to write like that. Being a teacher, he writes in flowery language for a while, but then…also being a stoic farmer type...just puts down the important stuff. It's pigs and cows and chickens, and crops being put in. But it's other, harder stuff, too. Like on January 28, 1856, when he wrote: "Baby still sick. Weather milder this evening." His son William was then only two weeks old. He had the flu, and he never got better. He died on May 18. The years pass. He has a daughter, Emily. Then another daughter, Allie. On March 13, 1861, Allie started feeling unwell. On March 14, they called the doctor. She had diphtheria. On March 15, two more doctors arrived. Aaron's journal entry on March 17, 1861 reads as follows: "Little Allie died this morning at 1/2 past 1. She dropped away calmly and easily. Her pleasant and mirthful voice will be heard no more. But God is too wise to err and too good to be unkind. Blessed be his name!" He buried her next to his son. On November 14 of 1864, he wrote: "Nellie sick." Just those two words. They recur for the next four days. Then on November 19, 1864, he writes: "Nellie worse this A.M. Dr. called. Nellie died this P.M. A patient little sufferer. She has gone home." They buried her next to her sister and brother. He buried three of his seven children, all under the age of five. My great-great-great grandmother Mary watched and wept as each of her little angels were put into the earth. Three little graves, all in a row. If they had been vaccinated, not a one of them would have died. Not one. Speaking from the long memory of my family, I want you to know that, down deep. Feel what it would be like to lose half of your children. Which of them would die? See their faces. It would be a coin toss. What terrible odds. I am convinced if you reached back into your heart memory, to the stories of your great great grandmothers who struggled to bear child after child only to weep over their cold little bodies, you would feel what they feel. I can feel you fighting this deep truth. Right now, you are fighting it, coming up with reasons that it is not so. That is what the demons of fear and anger do in us, when we bring the light of truth to bear on them. Do not listen to those dark voices, because along with the witness of God's creation, the lives of your foremothers and fathers bear witness against them. Those men and women would not believe the fear that our culture whispers into your heart. They would leap at the chance to protect their children, a chance they were never given. They might, hearing that you have chosen to unnecessarily risk the lives of their great-great-great children out of your fear, even be a little angry at you. Out of love for you, of course, but still angry. Remember them. Listen to them. For faith, and for family, honor their memory.